Porsche’s 911 GT3 R Hybrid will make a return to North American racing as Porsche Motorsport announced today the entry of the 911 GT3 R Hybrid Version 2.0 in the ModSpace American Le Mans Series Monterey presented by Patrón. The six-hour race on September 17 at Mazda Raceway Laguna Seca is the eighth round of the 2011 American Le Mans Series presented by Tequila Patrón. Two Porsche works pilots Romain Dumas (France) and Richard Lietz (Austria) will share the cockpit of the orange and white racer from Weissach. Dumas already has driven the world’s most innovative GT vehicle last year at Road Atlanta’s Petit Le Mans. 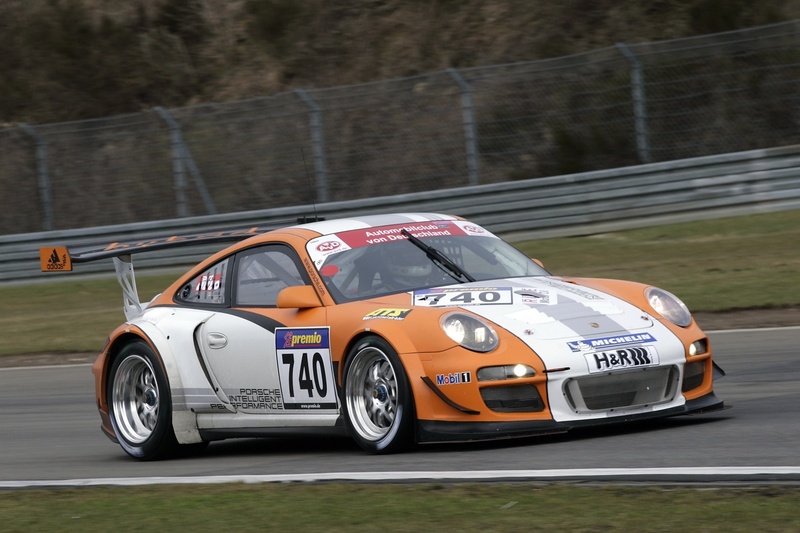 Lietz piloted the 911 Hybrid at the 24-hour races on the Nuerburgring in 2010 and 2011 as well as at various other long-distance races. The outing of Porsche’s hybrid racer at the 24 Hours of Nuerburgring last month was more than heartening. The innovative race car achieved the same quick lap times as its top rivals yet used considerably less fuel. Just two broken transmission flanges and a collision thwarted a potential podium spot. The Porsche 911 GT3 R Hybrid 2.0 - with two 75-kilowatt electric motors on the front axle supplementing the 465 hp four-liter, six-cylinder power unit at the rear - particularly embodies the philosophy of “Porsche Intelligent Performance”: The electric energy is generated during braking and stored in an electric flywheel. During acceleration, this energy is automatically delivered to the front wheels supporting the combustion engine. This leads to a reduction in fuel consumption and increases the cruising range on the circuit. Moreover, drivers can manually use the stored energy with a boost-paddle on the steering wheel for overtaking. The 911 GT3 R Hybrid has undergone further development since 2010; compared to its predecessor, its weight was reduced from 1,350 kilograms (2,970 pounds) to 1,300 kilograms (2,860 pounds). This weekend, the American Le Mans Series presented by Tequila Patrón is at Mid-Ohio Sports Car Course for the Mid-Ohio Sports Car Challenge. The fifth round of the 2011 ALMS championship is set for 3:30 p.m. ET on Saturday, August 6 with ESPN2 airing the race starting at 10 p.m. ET on Sunday, August 7. Live video coverage on race day will be available at 3:15 p.m. ET on ESPN3.com in the US, and americanlemans.com for international viewers. Canadian fans may also watch live coverage on Rogers Sportsnet. Worldwide radio coverage will be available on American Le Mans Radio at americanlemans.com.